A while ago I went on a short trip through Japan during which I discovered the beauty of the country, the people, but also the food. Based on local tips I visited many different noodle shops and, even though I did not always know what I ordered, I found out that each shop prepares and serves a bowl of ramen (noodles) in a different way. Ever since I have been looking for a place dedicated to serving ramen. 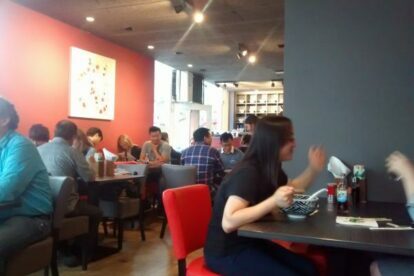 In Amsterdam you can find Fou Fow Ramen (see website) a nice place but we’re focusing on Rotterdam here. On my way to the gym I came across Hinoki, a noodle shop. A brand new noodle shop in the heart of Rotterdam, Arigatou gozaimasu! The moment you step in you will be welcomed by a kindly smiling waitress, ready to get your order. I haven’t had the time to check out all the different kinds of noodles but a Miso Ramen with a soft boiled egg and some dumplings on the side will do more than fine. The taste of the broth in which the noodles are served takes me back to a noodle shop somewhere around Fuji San. The noodles itself, medium thick and wavy, are made in Sapporo, Japan and carefully imported to Rotterdam. Located a minute away from the Markthal (check The Markthal article) you can now find Hinoki. Welcome to Rotterdam.